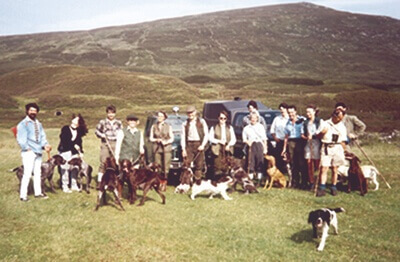 In Scotland we often have long distances to travel to meet other HPR enthusiasts and so we pride ourselves on the fact that we are a very friendly and approachable group and any of the HPR breeds are most welcome to join us for training. At present we have Spinone, GWPs, Vizslas, Wirehaired Vizslas, and GSPs all training with the group. Some of the members join with little or no knowledge of what an HPR does in the field and we aim to help them firstly with basic obedience and then on to the finer points of HPR work from puppy through to a mature working dog. Not everyone wants to trial their dog and we have many members who just want to have a good-mannered and capable dog that they can take out shooting or picking up or beating – whichever their choice is. Our summer training season runs from March through to October and we train on the second Sunday of the month on ground which is near perfect for our needs – rough grass, with reedy banks and access to a pond and a stream. In the winter we offer puppy and novice training for the very young dog which incorporates basic training and retrieving. We hold one or two working tests in the summer (depending on demand) and a Group Progress test and Puppy Test in September. In July we offer group members whose dogs have reached the required standard a number of days grouse counting at several locations around Scotland. This culminates in a very popular trial on a grouse moor, usually in the first week of the season. We also aim to offer our members at least two Tuition days in the year, run on the lines of a trial with each dog working singly for the guns, but within the requirements of the handler (i.e., is the dog ready to retrieve a bird shot off the point etc.) We usually have one on grouse and one on partridge and pheasant, these are self sufficient and are for eight to ten dogs and are normally fully subscribed. The Group also awards three trophies to its members. The Kellyhill Trophy is awarded to a (novice) handler for endeavour. The Puchill Holly Trophy awarded for the greatest number of Field Trial Points by an attending member, and the Inchmarlo Trophy for Field Trial and Championship Show Points with the same dog. Any further information will gladly be given. Contact the Secretary whose number and email address are at the end of this note and we will be very pleased to welcome any new members who wish to learn more about what HPRs do in the field’.